There are some places in Italy that you just fall in love with, places that you MUST visit when you go! La Spezia and the Cinque Terre (Italy’s five famous villages) are precisely those must-visit places! La Spezia is a charming port city in the north, and is the “Gateway to Cinque Terre”: Italy’s famous five villages you’ve likely seen in all of Italy’s tourism photos— with their picturesque, colourful buildings that sit along the mountainside. Cinque Terre, pronounced “chink-kwa tear-eh”, literally translates to five villages. These are Riomaggiore, Manarola, Corniglia, Vernazza and Monterosso. These seaside villages are located minutes from each other via train, which conveniently departs from La Spezia, but you can also hike to each village too. The area is actually considered a National Park, and the hike between villages is a popular hike that’ll give you breathtaking views. While in the region, Mike and I chose to stay in La Spezia, recommended by our friends Rez and Landon! La Spezia is located just an 8 minute train ride to the first of the five villages Riomaggiore (my favourite of the five). Over the years, La Spezia has become increasingly popular, as more people choose to stay there before venturing to Cinque Terre. The accommodations are cheaper in La Spezia than if you were to stay in Cinque Terre, and the roads are a lot easier to navigate with luggage! La Spezia makes a great home base for your northern Italy / Cinque Terre adventures! Below, I’ve highlighted some things to do in La Spezia and Cinque Terre, along with tips on getting around and where to stay. This Travel Guide should tell you everything you need to know about traveling to this lovely region in northern Italy! Pin + share my blog post Travel Guide to La Spezia and Cinque Terre, Italy! You can’t get to the Cinque Terre without first getting to La Spezia. We traveled to La Spezia by train, coming from Civitavecchia (the Port of Rome) after our Western Mediterranean Cruise. The train ride from Civitavecchia has no stops (hooray!) and took about 4 and a half hours. But there are many stations at popular cities all across Italy that will take you to La Spezia, including from Rome and Livorno/Pisa, and even as far south as Naples. If you’re headed to La Spezia, you’re probably taking the train. But La Spezia is also considered a port city (there are cruise ships that dock in La Spezia!) so you may also get here via boat. The ride to La Spezia is a long one, so ticket prices are much higher than if you were just going inter-city, or even to a stop just an hour away. I recommend you purchase your ticket in advance online, through TrenItalia, which you can navigate in English. Booking online will give you a bit more flexibility in picking departure time, number of stops, and lower prices. Booking online versus at the station saved us about 30 euro ($45 CAD)! Booking your La Spezia (or any Italian trip) online is also really quick, easy, and convenient, and then you don’t need to worry about validating your ticket in the station (though, that literally takes no time). Online tickets come pre-validated though, so you can just show your email PDF / screenshot of your ticket from your phone when the train attendants come to check tickets. You can get to the Cinque Terre via ferry or train. We took the train so I’m mostly talking about that: If taking the train from La Spezia, please note you need separate train tickets to get to Cinque Terre. You can buy these Cinque Terre cards online or get them at any of the train stations in any of the five villages plus La Spezia. Cinque Terre is actually considered a national park (Parco Nazionale Delle Cinque Terre), so your hiking / train + hike card is essentially like a national park pass. The train card is 16 euro per person, for unlimited train rides throughout a single day. Then they have rates for two days, three days, etc. We found this to be a pretty good deal to the alternative—paying for individual train tickets to each stop—because a one-way train ticket from La Spezia to Riomaggiore the first Cinque Terre village is already 8 euro a person. So even if you’re paying maybe a euro or two to get to the next few villages and then back, it’s still pricier than just 16 euro for an unlimited go in a day, without needing to stop at each station to get tickets. This Cinque Terre ticket + train card also gives you access to Wi-Fi at the train stations, which is handy as you wait between village visits (though wait times are pretty short. The trains come very regularly). As I mentioned, you can purchase your Cinque Terre ticket + train card at any station in La Spezia or the five villages, or grab them online, which I would recommend, again because it’s convenient. The online option is also nice because you never know when you’ll find a huge line-up at the station, of people wanting to buy their Cinque Terre card. (We saw this on the day of our Cinque Terre adventures). Avoid the lines and crowds by purchasing online! Note: we did not do the ferry option because I get sea sick on smaller boats, and the day we went the waves were quite active so the boats were rocking back and forth and I wasn’t having any of that lol, but ferries into the villages are also quite common, and a super cute way to visit. It’s also great for entire views of the villages (like the tourism photos!) though you would still be able to get to some pretty picture perfect spots if you don’t go with the ferry. As mentioned, hotel or room rentals in Cinque Terre are pricier than if you were to stay in La Spezia (some places are really pricy because the area draws so many tourists in). I highly recommend staying in La Spezia’s town centre because it’s just minutes walking distance from the train station, filled with restaurants, bakeries and shops, and is also in walking distance to La Spezia’s port! In La Spezia, we stayed at La Casa delle Acciughe (at Via Agostino Fossati 3), a room rental service located literally on the main, adorable city centre path which is only for pedestrian traffic, and lined with restaurants. 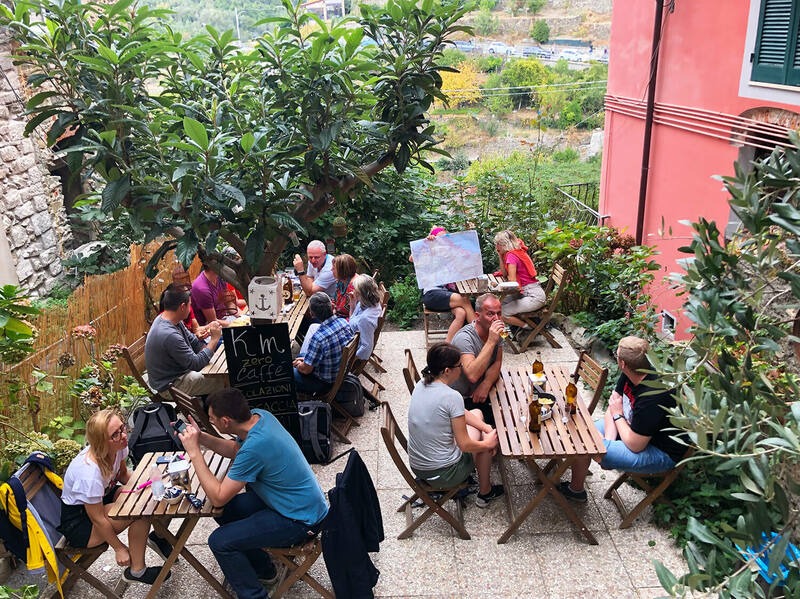 We would recommend staying at La Casa delle Acciughe—the owners are friendly, they provide you with a guide to La Spezia and Cinque Terre, there’s great Wi-Fi connection, clean bed and bathroom, a TV, air conditioning, little balcony, and a shared kitchen. Our stay here (off season, in October), cost $85 CAD per night (about 63 euro). For comparison, Cinque Terre rooms were more in the $150+ CAD per night range (though searching at time of writing this post, I saw that were a couple spots offering $90-$95 per night, though that’s not as common). There are a number of other room rentals and hotels we passed as we walked through the city centre to get to La Casa delle Accuighe, so you’ve got lots of options in La Spezia too, but we happily recommend this one! The biggest reason though that we recommend booking in La Spezia and not Cinque Terre aside from some cost savings, is that most of the Cinque Terre buildings are located on steep hills/cliffside of the mountains! Lugging your suitcase up and down these steep and sometimes narrow paths would be a real pain. We saw lots of people doing that when we visited the villages and they did not look happy! lol. 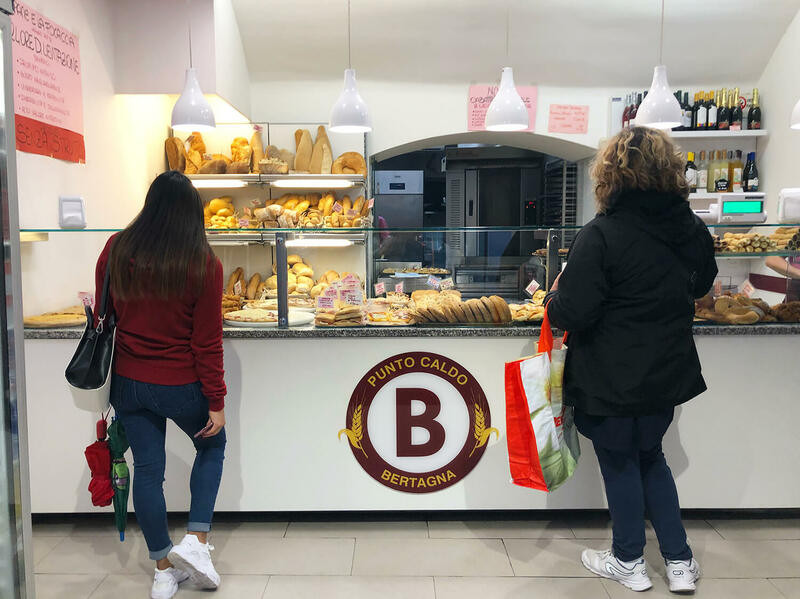 The best bakery in La Spezia (according to me!!!) Punto Caldo Bertagna. There’s lots to eat in La Spezia though. Our stops we literally picked just because we walked around and they caught our eye. 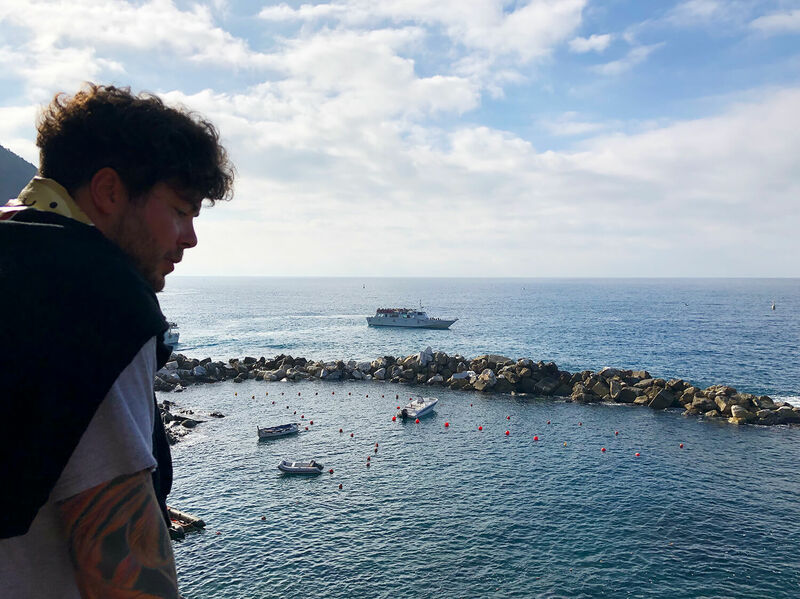 Check out these other spots on the Internet for some more La Spezia dining ideas, but I also recommend just walking and popping into a place!! (Well, check the menu and prices before you decide too. They list the menu outside most restaurants). Cinqure Terre and La Spezia are in the Liguria region of Italy, which is known for a few different food specialties, particularly—focaccia bread and pesto. Focaccia is a flat, oven-baked bread typically topped with olive oil, salt, and rosemary. Italians (not just in the Liguria region, but definitely, in the Liguria region) eat it for breakfast, as a snack, for lunch or for dinner. Basically, any time of day is a good time for focaccia. And can be used as the bread for sandwiches but often it is eaten just on its own. It’s delicious and a must-eat when you’re in this area. We had it at a few La Spezia bakeries, but also had a pizza focaccia in Corniglio (one of the Cinque Terre villages). 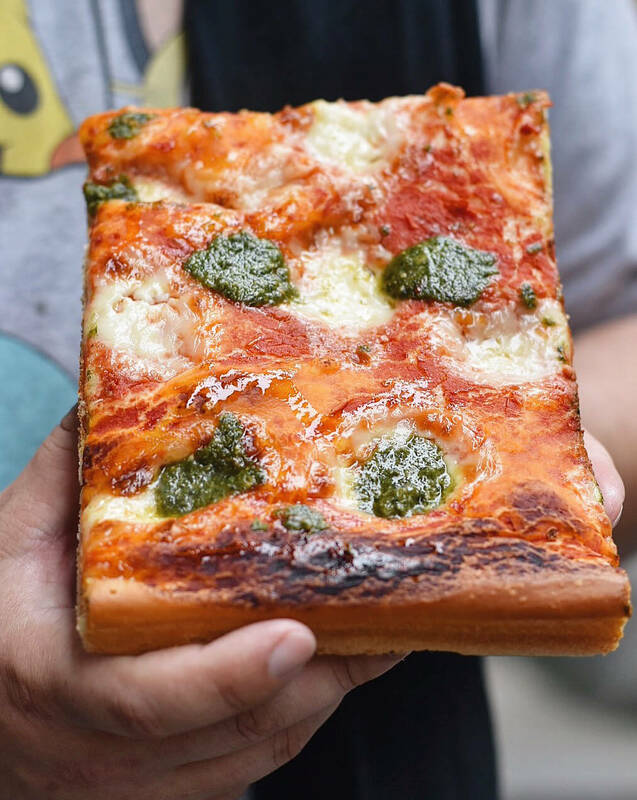 Delicious Ligurian Focaccia Bread (pizza style, with pesto and cheese). As for pesto. Oh pesto. Who doesn’t love pesto? 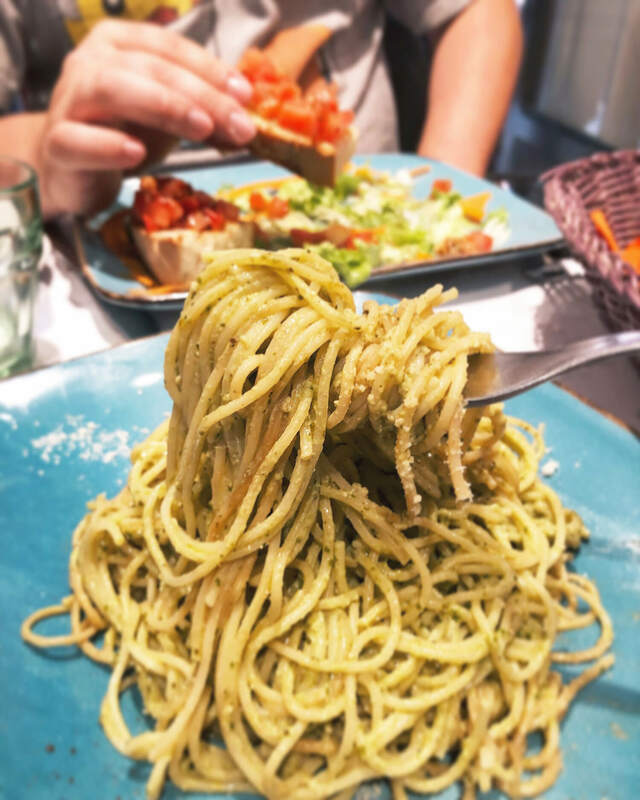 Pesto is a popular, green sauce that originated in Genoa, which is the capital city of the Liguria region (of which Cinque Terre and La Spezia are part of). Made up of basil (originally, Ligurian basil), garlic, olive oil, Parmigiano-Reggiano cheese and pine nuts, pesto is bright, delicious, and usually paired with long pasta. The pizza focaccia we had in Corniglio also had dollops of pesto, and in Manarola, we also had a plate of spaghetti pesto. So lovely! Pesto pasta in Manarola, Cinque Terre. Pesto originated in the Liguria region of Italy! You can find both focaccia and pesto in any village of the Cinque Terre, and in La Spezia. The Cinque Terre is also known for its seafood cones (literally just fried seafood dropped into a cone that you can carry around. Seafood on the go!) And of course, gelato, which is really a specialty all across Italy, is available anywhere you go in this region. Delicious gelato is available at any of the Cinque Terre five villages, and La Spezia (and well, really throughout Italy). Each village of the Cinque Terre has a bunch of cute restaurants, bakeries, bars, street food stands and of course, gelato shops, so the way we planned our eating/exploration was to try and have one or two regional bites per village. Feel free to copy this itinerary, but know that you could also get any of the suggested dishes at any of the villages! My favourite photo from the Cinque Terre Five Villages of Italy! In Riomaggiore, we tried deep fried seafood in a cone for the first time! My calamari cone (8 euro) was delicious. And so handy, I loved conveniently eating it as we walked around this first village, which is also often featured in those tourism photos. Head down to the water and you’ll find steps down to rocks where you can pose with the colourful buildings of Riomaggiore behind you. Just lovely! Mike also tried pizza from the same spot that sold the seafood cones (Mamma Mia Takeaway) and thought it was quite good. There are lots of cute little shops in Manarola! In the second village of Manarola, we had bruschetta and pesto spaghetti at a restaurant on the main walking path. We got a generous portion of pasta for under 8 euro, and three pieces of bruschetta for 7 euro. There are lots of cute shops in Manarola, so be sure to stop and shop here too! Reward yourself for climbing all those stairs in Corniglia! Corniglia is the most challenging of the five villages to get to. Unlike the other villages, where you can either step out to from the train station, or walk through a short tunnel to get to from the station, Corniglia instead has over 300 steps you need to climb before you reach the town centre. Corniglia, with how high it sits, gives you views of the other four villages. Its town centre is cute and interesting (very narrow walkways). You should definitely visit because you should visit all five villages of the Cinque Terre, but that hike up was a bit brutal (and we could only imagine how much tougher it would’ve been on a truly hot summer day). In Corniglia we pet a cute cat outside a market, and tried delicious pizza focaccia. There was actually a few outdoor dining spots that were pretty full when we stopped in. I think people might get so tired from their trek that eating here is probably a must just to re-energize, haha! Alternative transportation: you can wait to take a bus up to the town centre if you don’t think 300+ steps is worth your time and energy lol. Vernazza has a lovely little waterfront. The fourth village of the Cinque Terre—Vernazza—has a very similar vibe to Riomaggiore. It’s also apparently the most photographed and searches online might tell you it’s the most photogenic too, but I still think Riomaggiore has the better postcard / Instagram picture. Vernazza has a lovely square right off the water, lots of benches to sit and take in the view, and a bit of sand so kids were playing in the sand as well. 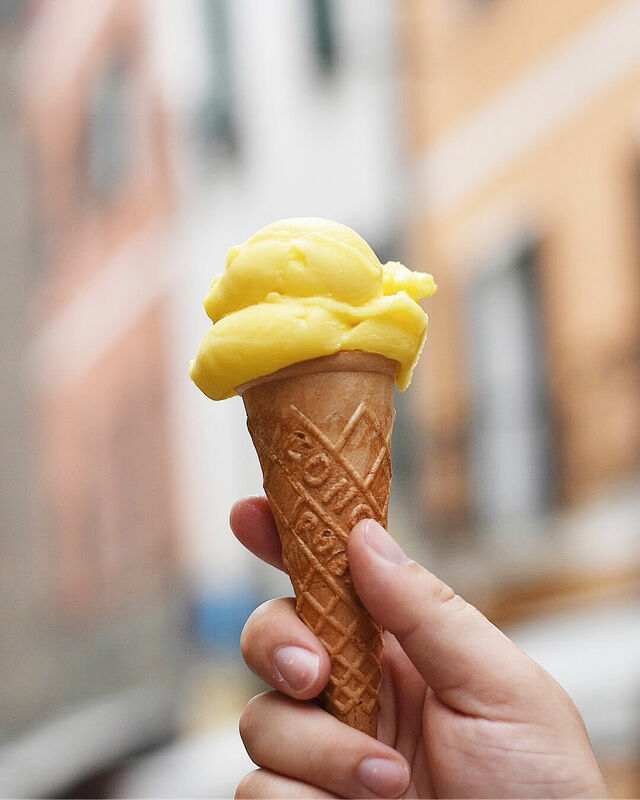 In Vernazza, I had mango gelato and it was amazing.Gelato Note: most one scoop, baby cone or cup gelato in La Spezia / Cinque Terre cost about 2 to 2.50 euro. If you find a 1 or 1.50 euro gelato, that’s a steal of a deal! Monterossa al Mare of the Cinque Terre is well-known for its beach! 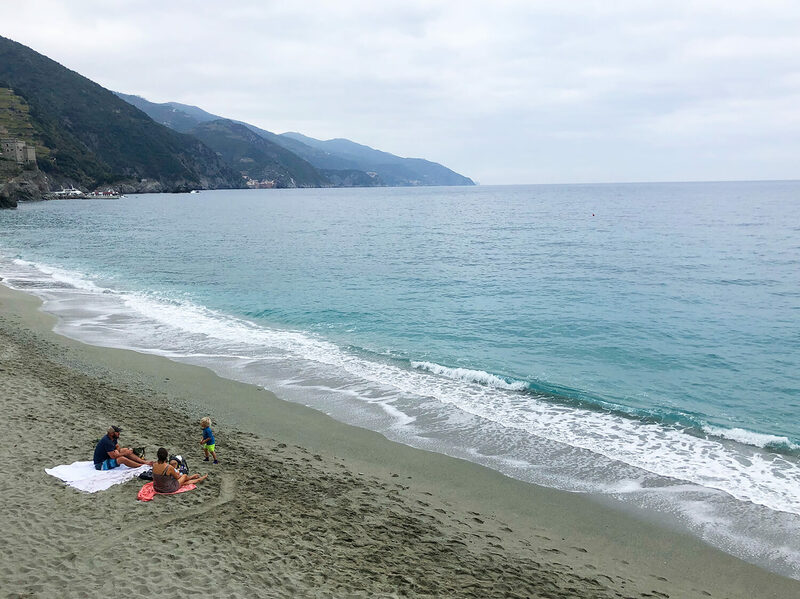 Monterosso is the only village in the Cinque Terre with a true beach so if you want to bask in the sun for a few hours in the Cinque Terre, Monterosso is your best place to do that. You’ll come upon the beach as soon as you exit the train station. In the summer months, the sand will be packed with people. When we went in October, there were probably more people selling beach towels than there were actually using the beach. We had more delicious gelato in Monterosso (one cookie dough for Mike and one lemon for me), though I would’ve loved to have sat down for some seafood pasta, or grab another seafood cone here. WHAT ELSE CAN YOU DO IN CINQUE TERRE? I think most people who visit the Cinque Terre (at least these social media days) do it for the ‘gram. I know I was looking for all the Instagrammable spots in each of the villages, but primarily I love to eat my way through a place I’m exploring so trying to eat at least one thing per village was a great itinerary for our day trip to Cinque Terre from La Spezia. If we had more time, we would’ve tried to sit down at a restaurant with an ocean view—some people recommended dining just before sunset for a really phenomenal experience of the Cinque Terre. There are lots of places to shop in all five villages—for things like souvenirs, magnets, mugs, towels, aprons, bags, kitchen supplies, clothes, artwork and more. 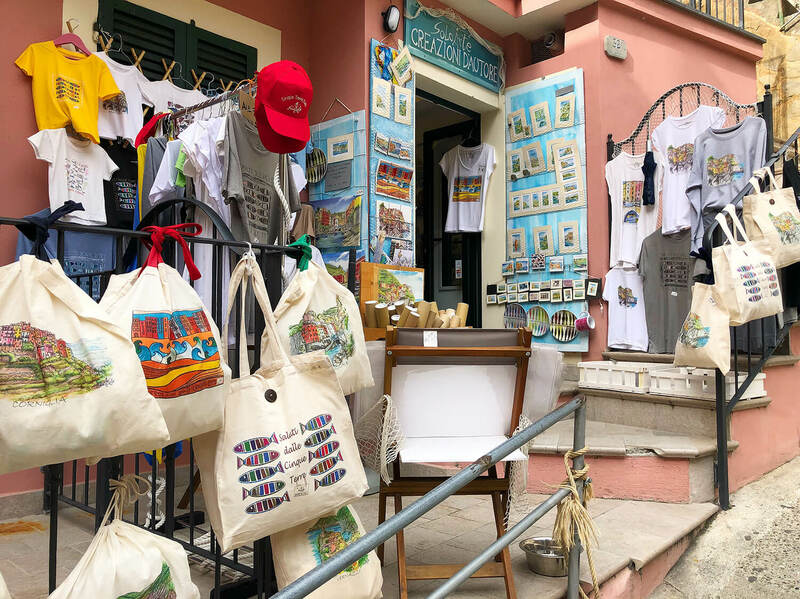 So you could certainly spend time exploring each of the individual shops (though, we did find the Cinque Terre magnets in La Spezia were cheaper than the magnets actually in Cinque Terre). Mike peering down to the waters from the Cinque Terre mountainside. And of course, you can do the famous hike!! There are hiking trails that connect all of the Cinque Terre and it’s supposed to be an exceptional hike with incredible views. You can apparently do this hike through all five villages in a day, but you might want to plan it so you’ve got extra time to spend in each village, or maybe your home base is La Spezia but you end up doing a night in one of the Cinque Terre villages so you can experience it at night, before hiking on to the next few the next day. IF YOU’RE TIGHT ON TIME, WHICH VILLAGES SHOULD YOU VISIT? On our Western Mediterranean Cruise, people could do Cinque Terre as a day trip from Livorno. You can’t do all five villages from that port though, so if you’re tight on time, I would recommend you visit Riomaggiore, Vernazza and Monterosso, and if you only have time for two, then my picks are Riomaggiore and Monterosso, primarily for the photo opportunities and beach. You can get similar food at any of the villages! If your cruise port stops in La Spezia, you should have time to visit all five villages as long as you don’t spend too much time in each. If you needed to drop one village, I would say Corniglia could probably go, since the 300+ steps to get up to the centre will eat up your precious time (lol). So there it is! 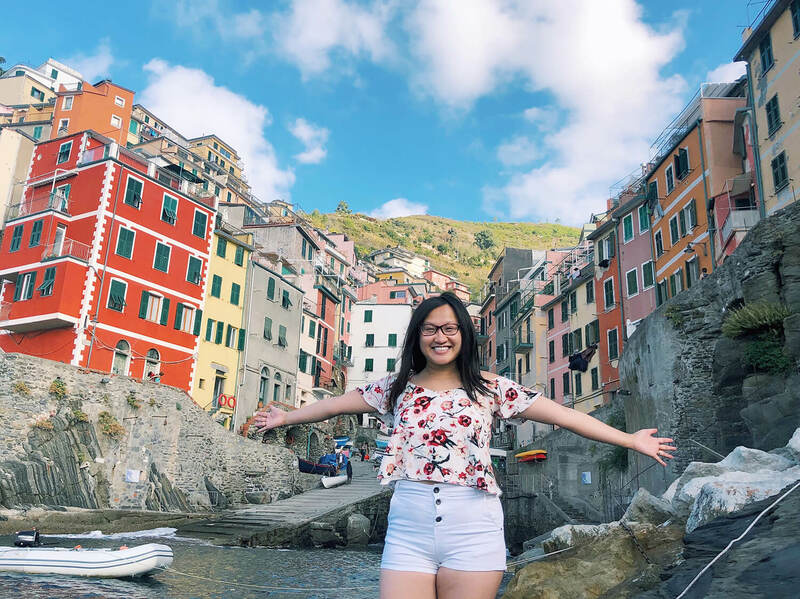 My Guide to La Spezia and the Cinque Terre, where I cover how to get there, where to stay, what to do and eat in both La Spezia and Cinque Terre, and what we did during our trip! While Mike and I only did a day trip to Cinque Terre from La Spezia, we felt we were able to exploree quite a bit of the five villages, and truly did fall in love with the region, even in the short amount of time there! 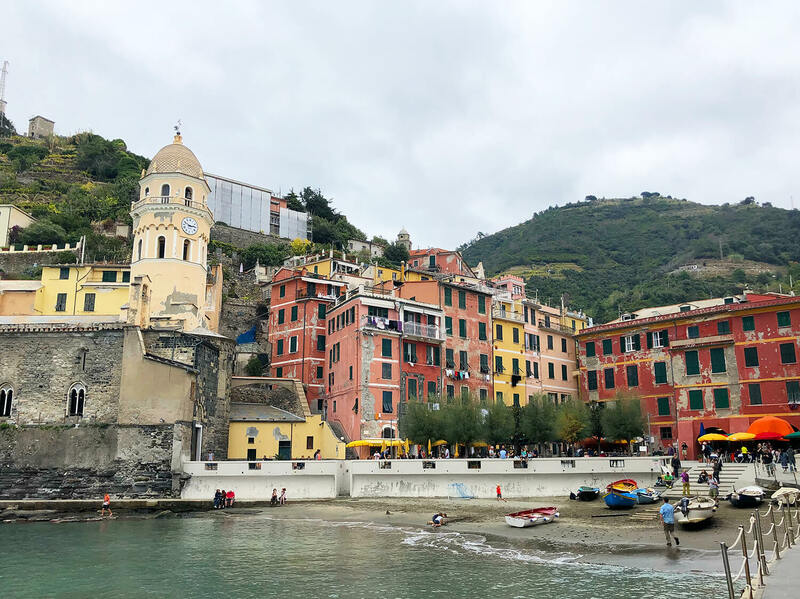 Our Italy trip took us all along the coast, north to south, from Rome to Livorno/Florence/Pisa, Naples/Sorrento/Positano/Amalfi Coast, and La Spezia/Cinque Terre, and our stay in La Spezia and Cinque Terre was easily one of the highlights of the trip. These are both areas in Italy we would recommend in a heart beat, and ones we would love to return to. 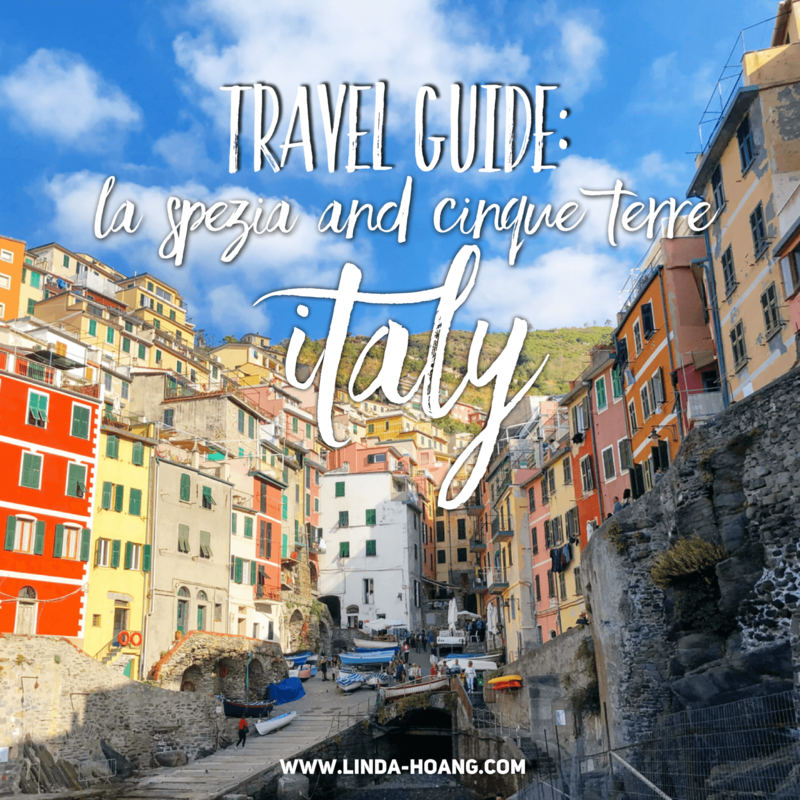 Hopefully this Travel Guide to La Spezia and Cinque Terre help you plan your visit! Let me know if you have any questions by leaving a comment on this blog post or sending me a note on social media! So have you been to La Spezia or Cinque Terre? Did you love them as much as I did? Thank you for sharing all your fabulous information! You guys had a wonderful time, so well planned out. If we were going on a big trip to Italy we would definitely follow all of your travels and restaurants. Everything sounded amazing! Thank you so much. Your blog is very interesting to prepare a future trip in 2020. We are a french group of Young retirées… always ready for new adventures. We intendant to stay 5 days there .